Santa Barbara boasts some of the world's most distinguished communities, each incredibly unique. One of the most prestigious and exclusive communities in the United States, Montecito is renowned as a favored residential and vacation retreat of the well-known and the well-heeled. Its impressive, often extraordinary homes and estates include many significant for their history, architecture or notable owners.Located adjacent to Santa Barbara proper, Montecito sets the standard of luxury living on California's Central Coast. With a population just shy of 10,000, Montecito is as exclusive as it is beautiful, and is considered to be one of the most sought after seaside communities in the world. It hosts two lovely and intimate commercial hubs — Upper Village and Lower Village; each one offering discriminating shops and restaurants. The two public and five private schools, as well as private Westmont College, are ranked among the finest learning institutions in California. In addition to its beautiful beaches, Montecito offers two public parks, three private golf courses and a private tennis club.More than just a beautiful place to live, Montecito and its residents are very protective of the community's esthetic beauty and community feel. Long considered to be one of the most powerful citizen bodies in the United States, the Montecito Association is truly passionate about protecting the natural beauty, architecture, history, its residents and their environment.If you are considering Montecito, then consider Maureen McDermut and experience the difference as you embark on a lifestyle afforded to only a select few. Maureen's unparalleled knowledge of the Montecito market is marked by her exceptional service and proven success. Santa Barbara is world renowned as the "American Riveria" and Central California's "South Coast." With its temperate climate and southern facing beaches, it is the gold standard of California living. Approximately ninety minutes northwest of Los Angeles, Santa Barbara has become a favorite getaway paradise for crowd-weary residents of Los Angeles, Orange County and San Diego, as well as travelers and part-time residents from all over the world. The 250 days of sunshine a year, and cool nights combine with outstanding geographical attributes to enhance this glorious location. The Santa Ynez Mountains soar skyward behind the city, with the dramatic sandstone colors forming a picturesque background. The glistening Pacific Ocean and dramatic Channel Islands are Santa Barbara's front yard. Santa Barbara's annual, week-long "Old Spanish Days" Fiesta, as well as its Summer Solstice Celebration and International Film and I Madonnari Festivals celebrate the vivid, internationally-influenced lifestyle for which this dynamic community has gained worldwide acclaim. The area is also renowned for its educational institutions – from award-winning public schools, to its exclusive private schools offering learning from kindergarten through high school. Santa Barbara is also home to a campus of the University of California; Westmont, a private, 4-year Christian college; the 2-year Santa Barbara City College; the internationally acclaimed Brooks Institute of Photography; the Fielding and Pacifica Graduate Institutes and other respected learning institutions. Although the history of Hope Ranch dates back at least 6,000 years to the time when this was home to the first Native Americans living here, this upscale community's modern history began in the mid-1800's when it was named for government agent Thomas Hope. Today, this verdant 2,000 acre enclave of gently rolling topography, stunning landscaping and magnificent ocean views hosts just under 700 residences; many of them luxurious estates perched on dramatic bluffs and with access to a private beach as well as two public beaches. Palm trees line beautiful Marina Drive, the main thoroughfare, which runs parallel to the coastal bicycle route. Hope Ranch is known for its cornucopia of recreational facilities, including polo and soccer fields, baseball diamonds and tennis courts, as well as the exclusive La Cumbre Golf and Country Club with its impressive and historic 18-hole course built around beautiful Laguna Blanca. Also known as an equestrian playground, and with an active Riding Trails Association, the Ranch hosts over 20 miles of equine trails traversing the public areas and leading to the beach. The Earl Warren Showgrounds, famous for its horse showing facilities, is a mere five minutes away. If you are considering Hope Ranch and its lifestyle afforded to only a select few, then consider Maureen McDermut. Her unparalleled knowledge of the Hope Ranch market is marked by her exceptional service and proven success. While the Mesa area of Santa Barbara is primarily residential, it offers a full range of shopping and restaurants, as well as a spectacular nature preserve and some of Santa Barbara's most popular parks and beaches. Its public schools are highly regarded, and the area is home to Santa Barbara City College, one of California's most respected two-year colleges. Offering a wonderful mix of single family homes, condominiums and apartments — many of which feature dramatic ocean, island and mountain views — the Mesa provides a true community feel for its residents, who include families, seniors and students. 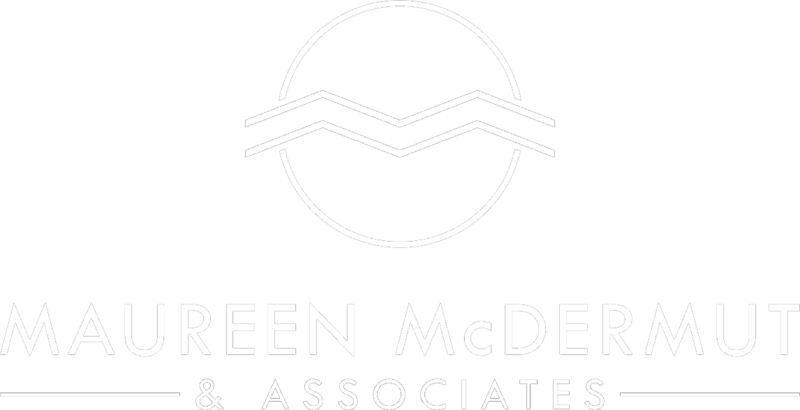 If you are considering the Mesa, consider Maureen McDermut and her unparalleled knowledge of the area, exceptional service and proven success. The view from this ridge rivals that of Europe's Riviera and offers a magnificent vista over the rooftops of Santa Barbara, and onward to the Pacific Ocean and Channel Islands. Many of the residences -– from modest homes, to impressive estates — also provide magnificent views of the Santa Ynez Mountains. The ridge was largely ignored as too steep to be of much use until a streetcar system was constructed in 1911, followed by roads. Soon thereafter, California established a Normal School there. Three decades later, it became the first campus of the University of California at Santa Barbara (now located in Goleta). The former campus is now the Riviera Center, an enclave of select businesses. Today, and as it has been doing for approximately 80 years, the Riviera Association monitors building and amenities regulations that were instigated as far back as 1913. They include mandates for underground utilities, and building restrictions prohibiting blocking any resident's unsurpassed views. The neighborhood maintains its status as one of the wealthiest in Santa Barbara, and boasts one of the best-educated populations. If you are considering the Riviera, you need Maureen McDermut's unparalleled knowledge of the Riviera market combined with her exceptional service and proven success. With its unique history and beautiful location next door to Montecito, Summerland is one of Santa Barbara County's sparkling little gems. Harry L. Williams founded Summerland decades ago as a place to pursue his interest in the supernatural. Like-minded citizens soon followed him and the town was born. Not long after the town was born, oil was discovered beneath its soil and just offshore. Fortunately, as the oil supply played out, the land was allowed to return to its former lush beauty. What remains is a petite, extraordinary, unparalleled village. Polo, the sport of royalty, is played regularly at the nearby Santa Barbara Polo & Racquet Club, while antique hunters enjoy the many shops along Summerland's lovely Lillie Avenue. Pristine Summerland Beach invites long walks or a cooling dip in the Pacific. This laid-back town of only 1,500 residents also offers flip-flop and family-friendly restaurants, and beautiful beachside Lookout Park, featuring expansive lawns, play areas and direct access to the beach. Summerland is home to artists, writers and part-time residents seeking a cozy cottage or spacious getaway nestled on a hillside overlooking the Pacific Ocean and Channel Islands.